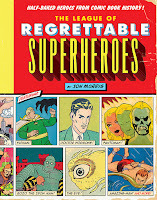 Book Review: "The League of Regrettable Superheroes"
I’m not a comics expert, but I have a great affinity for reading about comic books of years past. One of my favorite aspects of reading about these books is the often well-intentioned but ridiculous missteps that have occurred, such as an entry in the Superman universe that Glen Weldon gleefully (and affectionately) recounts on the NPR site where Jimmy Olsen travels back in time and starts a Beatles craze in ancient Judea. 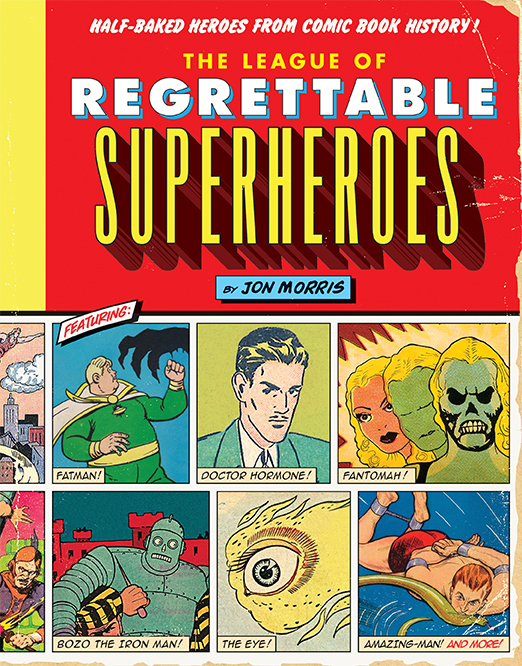 “The League of Regrettable Superheroes” by Jon Morris is dedicated to celebrating the wacky hijinks and preposterous storylines of yesteryear. However, rather than focusing on the missteps of well-known series, Morris’s book focuses on lesser-known and less-successful superheroes. Some have dubious origins (Captain Tootsie, a superhero/advertisement for Tootsie Rolls) while others seem to have been designed to take advantage of a trend popular at the time (Morris points out that Magicman, which debuted in 1965, was an attempt to cash in on shows like “Bewitched” and “I Dream of Jeannie”). In almost all cases, the superheroes are indeed regrettable, but Morris has palpable fondness for them even as he acknowledges how ridiculous and ill-conceived they are. The entries are organized into three parts – The Golden Age (1938 – 1949), the Silver Age (1950 –1969, a time that Glen Weldon refers to as The Crazypants Years), and the Modern Age (1970 – present day). Most entries are two pages in length, with a page dedicated to humorously and wryly describing the superhero and the other page featuring lavish color pictures from the comics (a few entries have four-page spreads, with the extra pages consisting mostly of pictures). As a sidebar, Morris includes a few quick facts on each hero, such as the creator and the debut info, as well as some snarky commentary (for instance, The Conqueror’s sidebar includes “Last seen: Moving inexorably toward Berlin”). While the setup might frustrate those who want further information, the format works very well for readers who want a general overview of the comics without too much minutiae to bog down the proceedings. Additionally, the use of full-color pictures throughout the book (in fact, all of the pictures are printed in color – Quirk does not skimp on the printing or layout) provide further insight into the heroes, as Morris wisely uses his subjects’ inherent insanity and inanity to speak for themselves. These features also make “The League of Regrettable Superheroes” perfect as a quirky and fun coffee-table book. In short, if you are looking for a serious and in-depth examination of failed comic book characters, then “The League of Regrettable Superheroes” might not be for you. However, it is perfect if you want an entertaining, approachable, and amusing look at unsuccessful or inept attempts at finding the next Superman or Batman. According to the liner notes for a CD I bought many years ago (when I still bought CDs), “Edelweiss,” Rogers and Hammerstein’s song about the Austrian flower, is one of the most moving songs ever. Even without the hyperbolic wording, it is easy to scoff at such a thought. The song seems like a sentimental side note within an even more sentimental musical and movie, a minor selection within the maudlin excess that is The Sound of Music. At first glance, it doesn’t even seem to completely fulfill the definition of moving. For most of the population, moving means grandiose declarations and copious weeping. Undoubtedly, musical theatre has offered numerous songs with more outright passion and pathos; from the Rogers and Hammerstein canon alone, songs such as “We Kiss in the Shadows,” “I’m in Love with a Wonderful Guy,” and “You’ll Never Walk Alone” offer considerable dramatic flair. By comparison, “Edelweiss” is a short, simple, and somewhat repetitious love song to nature. It lacks the tragedy of young lovers separated by circumstance, the exhilaration of falling in love for the first time, or the comfort in understanding that no one is truly alone. However, to simply dismiss “Edelweiss” as a clichéd ode to flowers does a great disservice to the song and its composers. One part of the song’s undeniable appeal and moving quality does have to do with its context within the film version of The Sound of Music. Alone in the spotlight, seeing the Nazi guards waiting to take him into custody so he can fight in the army, Captain Von Trapp starts singing this simple tribute to his homeland, a place that, according to the Nazis, no longer truly exists. In the film version, Christopher Plummer’s purported dislike of the project makes it even more meaningful. Even as he manfully sings and strums, Capt. Von Trapp’s voice cracks as he realizes the enormity of what has happened. For just a moment, Plummer’s cynicism fades, and he allows the audience to see the vulnerability and sadness lurking beneath the stoic façade. His family, led by the incomparable Julie Andrews, joins in and urges the audience to sing too. I still remember my 8th grade teacher’s explanation of this moment – “It’s like singing the National Anthem in the face of defeat. Despite the intense emotions associated with the scene, a close examination of the song reveals its considerable strengths without the context of Nazis, Austria, and Julie Andrews. “Edelweiss” was Oscar Hammerstein’s final work before succumbing to cancer. Unlike the obvious morality of “You’ll Never Walk Alone” or “Climb Ev'ry Mountain,” “Edelweiss” offers a more restrained method of inspiration. While time and life are fleeting, some things remain unchanged. In this sense, “Edelweiss” is also one of the most Romantic (with a capital R) of Rogers and Hammerstein’s songs; nature remains constant and provides a sense of comfort within this ever-changing world. The music takes a similarly understated and simplistic approach. Stripped of histrionics and vocal gymnastics, the tune emulates traditional folk music. This is not a song that lends itself to lush orchestrations or complicated choral arrangements; instead, it embraces the sincerity and spontaneity that usually only comes with impromptu singing. Every year, I consider not doing a literary Halloween post. After eight posts, it can be a little challenging to come up with something relatively new and/or different. However, after thinking about it and taking a quick look at my blog stats, I find that I can't resist. Here are a few new costume ideas from classic and not-so-classic literature. Lady Macbeth from Macbeth - Unlike some characters, there is no single, indelible image that is Lady Macbeth, which can be a bonus (even if it does require that you explain your costume to people throughout the evening). For Lady Macbeth, you can go with a more formal, regal look (think velvet gown and elaborate hair) or a more severe ensemble (whenever I picture Lady Macbeth, Judy Dench's version comes to mind). Perhaps her most recognizable outfit is the nightgown associated with the sleepwalking scene, which would allow you to be very comfy (layers would be a good thing) and mutter "Out, damned spot! Out, I say!" all evening. The Girls (Bridget, Carmen, Tibby, and Lena) from The Sisterhood of the Traveling Pants - This idea works best if you have three female friends who want a group costume but no one wants to spend a lot of time or money coming up with one. The main thing each person needs is a comfortable pair of flattering jeans. After that, personalize the looks based on the different characters. Bridget needs long blonde hair (or, if you want to go for the second book, poorly dyed black hair), a soccer jersey or flirty top (when she's trying to get Eric's attention), and maybe a soccer ball. Carmen is trendier and curvier than her friends. Tibby might have a blue streak in her hair, a Wallman's (or Walgreen's) smock/vest, a nose piercing, and a somewhat sour expression. Lena dresses on the preppier end of the spectrum and tries to blend in. The Narrator from "The Raven" - Our knowledge of the unnamed narrator of Poe's "The Raven" is limited, but he would be easy to recognize because of the raven. Given the late-in-the-day setting, slippers, pants, a shirt, and a nice robe would suffice. However, you would also need a stuffed raven to place on your shoulder (add the word "Nevermore" on a speech bubble coming out of the bird's mouth for further detail) or a friend to dress up as a raven to accompany you on your Halloween adventures. You might also have a picture of Lenore to look at and sigh over throughout the night. Princess Elizabeth from The Paper Bag Princess - Elizabeth makes a refreshing change from the typical princess archetypes in their tiaras and fancy dresses. Additionally, she would be a (relatively) easy last-minute costume. As the book title suggests, she wears a paper bag instead of a gown and goes on adventures. Given the (probably) chilly temperatures and decency laws, I don't recommend that you only wear a paper bag. Instead, wear tights (or shorts or pants, depending on your preferences) as well as a tank top or long-sleeved shirt underneath your paper bag (or brown paper) dress. While Elizabeth's dress was simple, you could go all Project Runway with the idea and make your creation a more elaborate affair by styling your paper bag just so. Scarlett O'Hara and Rhett Butler from Gone with the Wind - I can't believe that I haven't yet spotlighted Gone with the Wind here yet, but better late than never. I think that part of reluctant to include the book is that the movie, its costumes, and its overall look are so well known, but rather than run away from it, you could also embrace the iconography. Scarlett and Rhett (typically) require some planning, but the effect is well worth it. Depending on time, budget, and weather (seriously, running around in a hoop skirt and ballgown wouldn't terribly fun in 80 degree weather), you can go super-fancy in one of Scarlett's well-known, sumptuous ensembles, such as her green velvet dress (made from Tara's curtains), her red velvet party gown, or her picnic dress (Edelweiss Patterns has some beautiful pictures of a homemade version). To be a dapper Rhett, a period suit, preferably with tails and a vest, would do nicely. However, if you are short on time or actually want to fit into your car as Scarlett, you could go with her less famous but still iconic farmhand look by wearing a long, simple cotton dress and a determined if weary expression. Bonus points for defiantly saying, "As God as my witness..." throughout the evening. Rhett's dressed down look is even easier: all he needs is rakishly disheveled hair, long pants, and a white shirt (buttoning it up is optional).